We’ve been working with waxed canvas a lot lately. Personally, I love the stuff. Since we live in a rainy climate, it’s a natural way to repel moisture without the ultra-sporty look of a fabric like nylon cordura. It has a beautifully aged look, almost like leather, and has great body for making things like bags and coats. But there are a few things to be aware of when using this fabric at home. Expect imperfections. This is the main thing to be aware of when sewing (or buying) waxed canvas. The wax shows creases and scratches easily, but this is all part of the character of the fabric. It’s meant to develop the look of use. Use the right needle. This is true for any type of heavy fabric. If you think your machine is having trouble with layers of tick fabric, check to see if you might just need a bigger needle. A 100/16 or 110/18 is just about right. Use a press cloth. The waxes and oils can melt with the heat of your iron, so protect it with a press cloth. Use a clapper to press. Again, this is a good tip for any heavy fabric. A clapper allows you to apply pressure and steam for a longer period of time, letting you get crisp edges. If you’ve never used one, it’s really easy. Just apply steam with your iron, then quickly apply the clapper and use your body to apply lots of downward pressure as the fabric cools. The clapper traps steam in the fabric as you press. Clean your machine. This is my number one tip. Sewing with waxed canvas can result in gunky buildup in your machine, so it’s important that you give it a thorough cleaning after use. Follow our sewing machine maintenance tips for an idea on what to do when you’re done. So that’s what we’ve learned. Anyone else have tips to add? Oh, and for some ideas about where to buy waxed canvas and other heavy duty fabrics, don’t forget to read our post on bag making resources. gotta be better than sewing on fake fur…. ugh…. fuzz everywhere…. Love Thread Heaven great tip i didn’t think to use it with waxed canvas! I have a clapper, but didn’t know you ‘apply’ it to the fabric…thought you pressed while the item was on the clapper … guess I need to see if there’s a YouTube video on it. There wasn’t a guideline or how-to. I just knew I needed one. :) PLUS, this is so timely, my husband just said he wanted a messenger bag for Christmas and I was looking for a manly fabric/pattern. Yay! Sounds like a post on the clapper (and maybe other pressing tools) might be a good idea. Gabriel has a good description below. Most clappers (but not all) have two sides. One is a narrow part for helping open narrow seams, with a point presser on the end of it. The other part is a flat block that you can use to press down bulky seams as I’ve described. It’s slightly confusing because of the different uses, I think. Yes, please do a post about the most commonly used tools. I’m new to sewing and was also wondering about a clapper and how to use a tailor’s ham. do a google image search on “pressing tools clapper” and you’ll get lots of pictures. basically, it’s a shaped, wooden pressing surface that helps press open seams when you can’t get the iron in there, or flatten out seams more aggressively without damaging either your iron, or fabric surface. I really liked this pattern when you introduced it a couple of weeks ago. But I am trying not to buy any more patterns until I make what I have. The more I look at it made in the waxed fabric, the more I feel my resolve crumble. It is practical and beautiful at the same time. I’m going to have a go at a waxed canvas Albion (version 1) lined with cotton flannel a la Barbour jackets. Christmas present for my Dad, I think (any excuse!). SO thanks for these tips. I’m so excited about the Albion. I was just getting ready to start a lady grey in red wool for myself but the appeal of a hood is just too string after the weather here in the UK has turned chillly so I’ll be using the fabric for a nice red Albion for myself too. I’m interested to hear any tips for making the version 1 more feminine (ie to accommodate “the girls” and my ample backside without being too big and boxy on the rest of me – shoulders etc.). Love these new patterns. Thank you! I am so new to working with any kind of canvas, so my apologies if these are rookie questions. What is the appropriate way to pre-treat canvas and waxed canvas? Some web retailers suggest hand-washing in cold water. Would you line dry the fabric then? Waxed canvas is intended to just be wiped clean. I wouldn’t pre-wash it. For canvas, I like to wash it, especially if it’s a color that could possibly bleed. 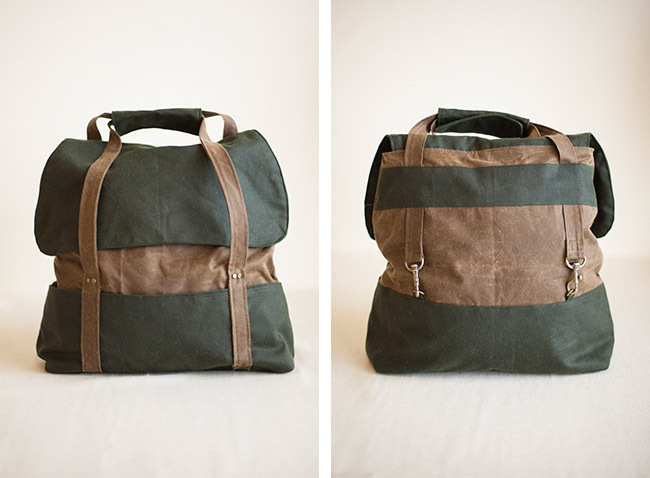 Any tips on purchasing waxed canvas? I bought some a year ago for a jacket, and had trouble knowing what weight to get and even sourcing it online. What weight did you use and do you have any resources for where to purchase? I posted a bunch of resources the other day, and there are great suggestions in the comments too! Where do you buy the waxed cotton? Would love to make a bag with it. Sorry, I just saw to post before mine. So what about the pattern for bags? Great tips on sewing waxed cotton! I do a lot of wax cotton jacket repair work here in the Scottish hinterlands and had to learn those tips on my own (sniffle). I can add two more – the roller foot or the ‘teflon’ foot are very helpful presser foot choices when sewing wax cotton fabric, and lengthening the stitch gives a very lovely appearance to top stitching, very professional looking. Instead of a 2.5 length, use a 3 for a strong, attractive stitch. It’s entertainingly written, and I’ll let you know about my personal blowtorch test. I sew custom nylon gear and use Cordura (a VERY similar fabric) daily. A new #16 or higher needle is super important. The right weight thread will save a lot of headaches (it can be used later for top-stitching so don’t hesitate if you only want to make one bag). And again, #5 – CLEAN YOUR MACHINE AFTER!! The wax build up is REALLY not good for your machine and it is relatively easy to get out.